Amazing as it may seem (well, to me at least), our little boy turned one year old near the end of March. My mom flew out for the celebration, which was a small family affair combining Nolan’s birthday party with his dedication. I was mostly busy straightening up the house for company, but I made several savory hors d’oeuvres for our guests to snack on. 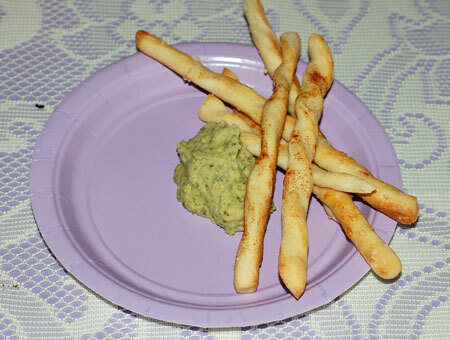 This is my homemade grissini with whipped spinach and chickpea hummus. The grissini was a recipe from the King Arthur cookbook, and made enough breadsticks for a week’s worth of snacking. I seasoned them variously with za’atar, smoked paprika, sesame seeds, and Parmesan cheese, and Nolan loved them, with or without a dip in the hummus. I also stuffed some split baby bell peppers with a mixture of feta and ricotta, but those were all eaten up before I remembered to get a photo. Combine all the dough ingredients and knead them together, by hand or mixer, until you have a soft, smooth dough. Cover and allow to rise for 1 to 1 1/2 hours, or until it doubles in bulk. Transfer to a lightly greased work surface, and roll out into a 10×20 rectangle. You may need to give it a few minutes to relax during the course of rolling it out, if it wants to spring back too much. If you want to cover it with seeds or spices, brush the dough lightly with egg wash and sprinkle with seeds or spices. If you don’t want to add any toppings, brush the dough with olive oil instead of the egg. Use a pizza wheel or sharp knife to cut the dough the short way into 1/4″ wide strips. Twist the strips along their length in opposite directions, and place on a parchment lined baking sheet. Cover and allow to rest for 30 minutes. Preheat oven to 425F. Bake the grissini for 12-14 minutes, until golden brown. Keep a close eye on them because they can go from golden to burned quickly. Source: King Arthur Flour Bakers Companion. 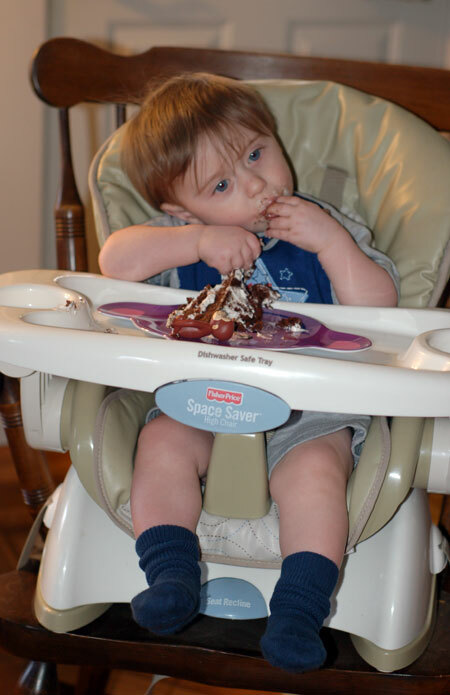 Of course, the highlight of Nolan’s birthday party had to be his cake. 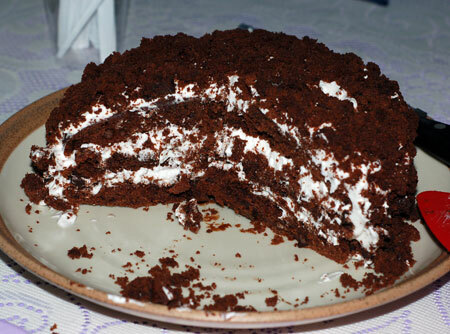 Knowing that Nolan is already a big chocolate fan but not wanting the mess of chocolate frosting, I went with the devil’s food white-out cake in Baking: From My Home to Yours. 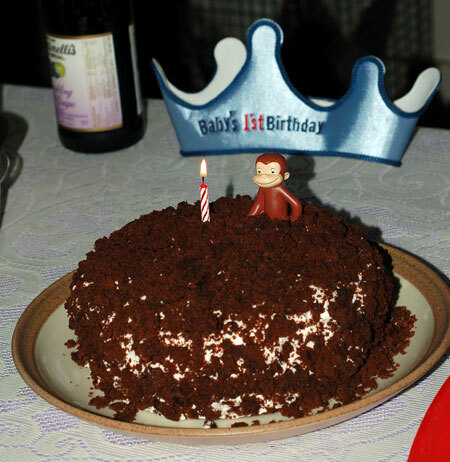 It made the perfect baby birthday cake: moist and chocolatey, but not too big or fussy, and with that crumb coat, it just begged to be eaten with chubby little fingers. 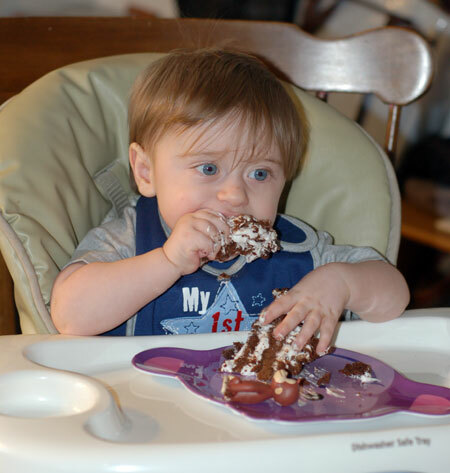 Nolan had never eaten sweets more than a pinch at a time, so we weren’t sure how he would react to a whole slice of cake. But he dove right in without the slightest hesitation and proceeded to eat the entire thing. He didn’t even make all that big a mess, considering. My husband also posted a little video of Nolan chowing down on our main website if anyone is interested.